Reversible, clamps 3 or 4 inner strings, or 4 outer strings on most guitars. Does everything an Esus capo does plus a lot more. Perfect for "Liberty Tuning." Plenty of "reach" and clearance for higher frets and higher action.Strong but ultra-light metal design, fits in your pocket, easy to reach over and around, Young kids can operate it. Does most of the important partial capo ideas. Slower to operate than spring capos. Other than that it works better, looks better, and is more versatile & adjustable than any other partial capos. Reversible, clamps 6 or 5 on most steel string or radius fingerboards. Strong but ultra-light metal design, fits in your pocket, easy to reach over and around, Young kids can operate it. Slower to operate than spring capos. It also works better, looks better, and is more versatile & adjustable than any other capos. 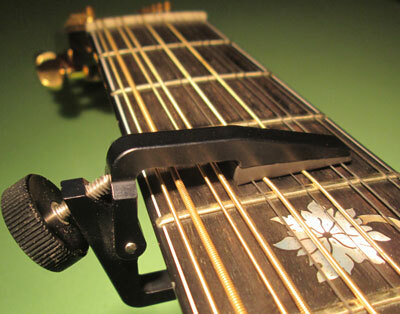 Durable, inexpensive, clamps 63 different combinations at each fret, plus works as full capo. Unchanged since 1976. The most universal partial capo. Does all 63 possible configurations at each fret on all guitars. Same model fits electric, acoustic, 12-string, classical. Slower to operate and harder to reach around than single-purpose capos. Most "low-tech" looking. Very low-profile, easy to reach over & behind, very durable. Can form Esus chord or A chord at 2nd fret, or do other things at higher frets. Fits in your pocket. Requires 2 hands to put on or move. Fastest action of any capo. Goes on or off with one hand, even in mid-song. Nice hard rubber foot has good tone. Stores on headstock if you like. Harder to reach over than the Shubb, spring mechanism may be too strong or too weak. Awkward to keep in your pocket. Can pull sideways on thick necks. Attractive, low profile,easy to reach around, good tone from rubber. Very poor string clearance, hits bass string if you use it at higher frets. Easy to bump out of position. Can't handle many kinds of necks. Clamps 5 strings on bass or treble side -- can often clamp only 4 strings ! Strong, durable, low-profile, lightweight, inexpensive, attractive. Also a banjo, uke or mandolin capo. Very useful new tool. Few disadvantages. Screw can fall out and get lost. Only available in black. Very strong, durable, low-profile, can be easily shortened or notched for custom capos. Can double as a banjo or mandolin capo. Requires 2 hands to put on or move. On most guitars, you can capo 5 strings with just a normal capo slid over, so this is a luxury & not a necessity. Fast operation, can store on headstock or strap. Hard rubber has good tone- does not deaden strings. Weaker clamp mechanism, hard to reach over, difficult to shorten or modify. On most guitars, you can capo 5 strings with just a normal capo slid over, and this one usually can't handle just 4 strings. Very poor string clearance, hits bass string if you use it at higher frets. Easy to bump out of position. Very fast operation, can store on headstock or strap. Lever clamps 2 strings under capo. Can also use at frets 4, 5 7. Does some very interesting things. Expensive. Can get in your way. Tricky to operate lever. Calls attention to itself. Very fast operation, can store on headstock or strap. Lever clamps 1 string under capo. Can also use at frets 4, 5 7. Expensive. Can get in your way. Tricky to operate lever. Fast operation, can store on headstock or strap, nice tone. Lever clamps 1 string under capo. Can also use at frets 4, 5 7. Fast operation. Good tone. Lever clamps 1 string under capo. Can also possibly use at frets 4, 5 7. Expensive. Can get in your way. Tricky to operate lever. This configuration is not as widely used as others. Very low-profile, easy to reach around. Capos either E string at any fret. Can sometimes use to capo 5th stringof a banjo. Sometimes wiggles off, does not fit wide necks, has trouble higher up on neck around heel. Very low-profile, easy to reach around. Can capo 2 outer strings on either side of fingerboard. Place above 5,7 or 12th fret to graze strings and sound harmonics. Makes absolutely amazing sounds. Hard to keep in place- if you bump it or even set it down the pushbuttons can move. May not fit different shape neck heels. Unique, can do things no other capo can do. Comes in several models shaped like E, D, G, C chords. Can be moved around & rotated for new ideas. Requires another capo to hold it down, small parts fall off and are easy to lose, easy to bump out of position, can be unstable. Cannot flip around to form A chord, only works on a few frets, and does not work well on short or long-scales. Spring mechanism weakens. Expensive. Does things nothing else can do. Does not attach very securely (velcro) and has trouble accomodating different fingerboard widths and string spacings. Blocks 4 frets of your fingerboard, and looks pretty odd. Expensive.